Anne Sibley O'Brien knew she wanted to be an artist by the time she was seven. Born in Chicago, she moved with her family to New Hampshire on her first birthday. Six years later, her parents were hired as medical missionaries and assigned to serve in South Korea. She was raised bilingual and bicultural, living in the cities of Seoul and Taegu, and on the island of Kojedo. Returning to the US at age 19, Annie attended Mount Holyoke College where she majored in studio art. She spent her junior year back in Korea at Ewha Women's University in Seoul, where she studied Korean arts, including oriental painting. During college, she decided that she wanted to pursue a career in children's book illustration. She has illustrated more than twenty-five picture books, including the Jamaica books by Juanita Havill (Houghton Mifflin) and the Talking Walls books by Margy Burns Knight (Tilsbury). Anne lives on Peaks Island in Maine. Whether readers are new themselves or meeting those who are new, there are lessons to be learned here about perseverance, bravery, and inclusion, and O’Brien’s lessons are heartfelt and poetically rendered. Being the new student in a classroom is difficult enough, but when the child comes from another culture and speaks a different language, it can be extremely stressful and lonely. Three youngsters enter a new school—Maria from Guatemala, Jin from Korea, and Fatimah from Somalia—and each one experiences the feeling of not fitting in. They slowly learn to find ways to assimilate and, in fact, to shine as their inclusion in the classroom enriches the lives of the other children. Maria asks to join a group playing soccer, Jin teaches a fellow student some words written in Korean, and Fatimah gains enough confidence to share her artwork with the group. Brightly hued watercolors on stark white backgrounds show the children’s adjustment to the new situation and their classmates’ ready acceptance. “A Note from the Author” page includes a list of recommended readings on the same subject. VERDICT The title would be useful in sparking a discussion, and the simple text makes it a good choice for beginning readers. This well-conceived, thoughtful picture book traces the first day at a new school for three children with very different experiences of adjusting, linguistically and culturally. "Back home I knew the language," says Maria, remembering her days of playing fútbol (American soccer) with her friends. "Here there are new words. I can't understand them." Anne Sibley O'Brien (The Legend of Hong Kil Dong) shows Maria on the sidelines of her new school hearing alien sounds while watching others play ("wun too"; "Mai tern," say the thought balloons). Jin is confronted with an entirely new alphabet: "Back home I could read and write," he says. "I shaped the letters and stacked them like blocks into words." As with Maria's example, Sibley O'Brien depicts Jin's experience in his homeland (Korea) on the left, and the scene in his new school on the right, with letters that "lie on the page like scribbles and scratches." Fatimah, wearing a hijab, says, "Here there are new ways.... I cannot find my place." But when her teacher asks the students to make drawings of life in their community, Fatimah volunteers to show her picture and connects with a classmate. Jin also makes a friend, and Maria finds her way through soccer. Because Sibley O'Brien spotlights three examples, no child will feel singled out. She paves the way for teachers and parents to share this with children both as a way of preparing a new student, and as a way to welcome a classmate who may share this trio's predicament. Based on her own experiences living in another country as a young child, Sibley shows the challenges of three new American students as they navigate their first day of school. Maria, from Guatemala, struggles with English, but her love of soccer enables her to make new friends. Writing is difficult for Jin, from South Korea, but he finds that sharing his language with another student helps him unlock his stories. Meanwhile, Fatimah, from Somalia, is having trouble fitting in and is afraid of making mistakes. Encouraged by a classmate, she uses drawing as a way to connect her two cultures. The simplicity of the narrative combined with vibrant watercolor artwork depicting a wide range of diversity results in a powerful message of empathy for the immigrant experience. 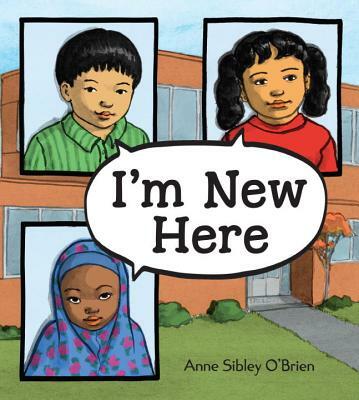 Additionally, an author's note explains why some families emigrate and how readers can help new Americans transition and provides a link to the I'm Your Neighbor project, which promotes children's literature featuring new arrivals.